WASHINGTON — House Republicans reacted tepidly at best Wednesday to calls from the upper reaches of both political parties for legislation funding the Department of Homeland Security without immigration-related add-ons opposed by the White House. Three days before a threatened partial shutdown at the agency, House Speaker John Boehner declined repeatedly to say what he would recommend to his conservative, fractious rank-and-file if the funding bill clears the Republican-controlled Senate. “I’m waiting for the Senate to act. The House has done their job,” he said after a closed-door meeting of the rank-and-file. Even so, lawmakers were told to be prepared to spend the weekend in the Capitol to resolve the issue. Another frequent Republican rebel, Rep. Matt Salmon of Arizona, said Boehner would find himself on “very thin ice” if he relied primarily on Democratic votes to pass a DHS funding bill stripped of provisions to roll back immigration directives that President Barack Obama issued in 2012 and last year. House Republicans reacted as Senate Democrats arranged a midday meeting to review McConnell’s day-old proposal, and the administration stepped up the pressure on the GOP to fund an agency with major anti-terrorism responsibilities. Officials have said that more than 85 percent of the agency’s work force — 200,000 out of 230,000 employees— would continue to work even if the funding were not approved, because they are deemed essential for the protection of human life and property. That includes front-line workers at the Customs and Border Patrol, the Secret Service and the Transportation Security Administration. Johnson also said a short-term extension would be problematic and that inadequate funding after Friday’s midnight deadline would deal the department a substantial blow. “It’s like trying to drive across country on no more than five miles of gas at a time and you don’t know when the next gas station is going to appear,” he said. For his part, Obama arranged to deliver an immigration-related speech later Wednesday in Miami, home to a large immigrant population. McConnell’s proposal envisioned two separate votes, one on a bill to fund the Homeland Security Department, and the other to overturn Obama’s recent executive actions sparing millions of immigrants in this country illegally from deportation. Yet with a partial shutdown set to trigger at midnight Friday without congressional action, options were few for Republicans who won full control of Congress in November’s midterm elections in part on promises to block Obama’s immigration policies. They could allow the agency’s funding to expire, violating their leaders’ promises that there would be no more shutdowns on the GOP watch. They could try to pass a short-term extension of current funding levels, postponing the conflict to another day. Or they could go along with McConnell’s strategy of funding the agency fully while registering their disapproval of Obama’s immigration policies with a separate vote. There was criticism from some Senate conservatives, notably Ted Cruz of Texas, a potential 2016 presidential candidate. But it was unclear how widespread the sentiment was. For their part, after initial reluctance Senate Democrats looked ready to go along with the Senate GOP leader. 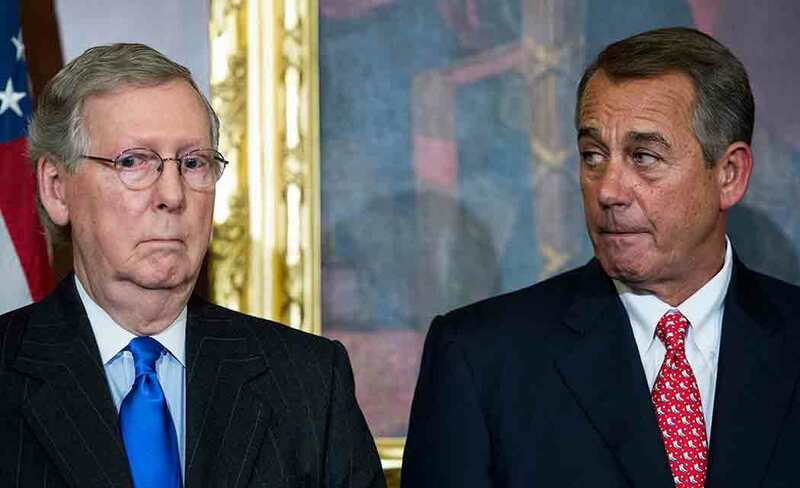 “The issue’s very simple: Fully fund the Department of Homeland Security,” said Sen. Patty Murray, D-Wash.
One House Republican allied with Boehner predicted Tuesday night that McConnell’s plan might win approval. Noting that a federal judge in Texas has issued an order blocking implementation of Obama’s plan, Rep. Tom Cole of Oklahoma said the court had “effectively stopped the president’s executive action,” at least now. “So I don’t think we’d run the risk of shutting down Homeland Security,” he added. The struggle dates to last fall, when Boehner told fellow Republicans they should allow the funding of Homeland Security without conditions until after the elections, when Republicans would have more leverage.